Nitroaromatic compounds (NACs) are widely employed in the explosives (e.g. trinitrotoluene, TNT) and pesticides industries and as intermediates in chemical synthesis. They can show strong toxic and carcinogenic effects resulting from the tendency of the nitro group to participate in radical formation reactions. Following their extensive use NACs have become prevalent contaminants in groundwater, situation which poses an obvious risk towards population exposure through drinking water supplies. Natural attenuation of groundwater involves the removal of contaminants by natively occurring microorganisms or by abiotic transformations, situation beneficial in theory, with human intervention required only to monitor the process. The potential for natural attenuation in the case of NAC contamination is under analysis. One process which contributes towards the removal of NACs involves their reaction with Fe(II) dissolved in groundwater in the presence of iron oxide nanoparticles such as goethite. The system functions by allowing adsorption of both Fe (II) and the NAC onto the nanoparticle surface before reaction occurs. Under natural conditions the occurrence of nonreactive clays together with the iron oxide deposits is widespread. The effect such clays have remains unexplored despite extensive research having been carried out into the process of natural groundwater attenuation. Arnold and Penn have performed a study to elucidate the effect that kaolinite (a nonreactive clay) has on the reduction of 4-chloronitrobenzene (a model NAC contaminant) by the widespread Fe(II)/goethite system. 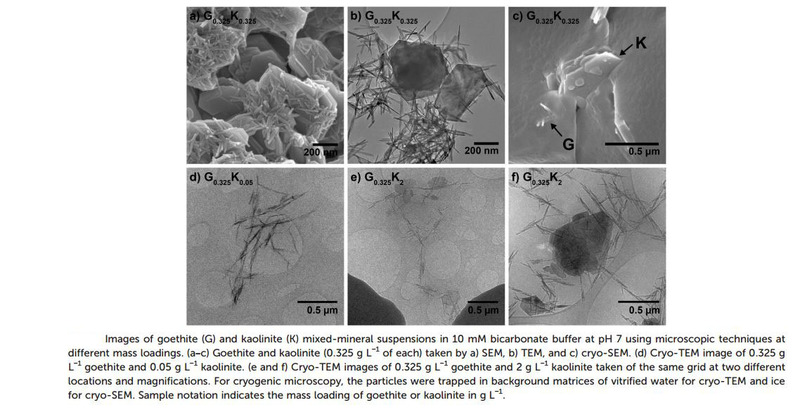 Measuring the rate of reaction in the presence and absence of kaolinite revealed the detrimental effect the clay component had on the decontamination process. A detailed study was carried out by employing specialised cryo-microscopy analysis of the particles present within the reaction mixtures. Normal microscopy techniques were deemed unsuitable as the process of sample preparation required their drying. Freezing the liquid samples instead allowed for the true nature of the solution to be analysed without alteration. Deciding whether decontamination can be carried out through an active or passive method relies on a detailed understanding of the processes occurring on site. The current study adds to the body of knowledge necessary for such an analysis and draws attention to the role of some of the major components found on sites for which natural attenuation is under consideration. Dan Mercea is a PhD student in the Fuchter group at Imperial College London. 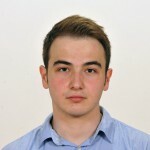 He is working on developing enantioselective FLP catalysis. Selenium (Se) is a metalloid element found in trace amounts in the earth’s crust and which has found extensive application due to its semiconducting properties. The use in photocopiers, microelectronic circuits and other applications has created a demand which makes selenium a valuable element. Selenium also shows biological activity with a strong dependence on concentration: it is essential in low doses for mammalian organisms but becomes strongly toxic to humans over a certain intake threshold. Efficient removal of selenium from wastewater being discharged in the environment is imperative and the development of cost-effective procedures to achieve this needs to be addressed. Under typical environmental conditions Se can be found in a variety of oxidation states (-II, 0, IV, and VI). The former two are insoluble and give rise to little toxicity on account of their low mobility in aqueous phases. The latter two however are found as highly mobile oxyanions which are the principal targets for Se removal. 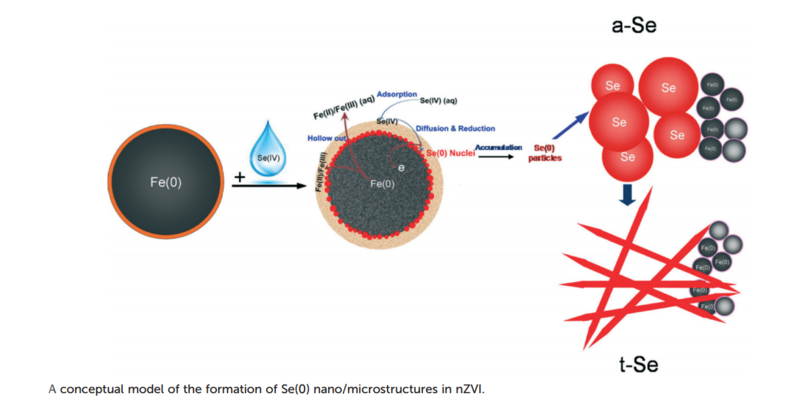 Ling et al have used an established strategy involving the reduction of Se(IV) to the insoluble Se(0) form, but their choice of nanoscale zero-valent iron (nZVI) as the reagent has led to a superior method of wastewater decontamination being developed. As little as 0.2 g L-1 nZVI can achieve over 99% removal of high levels of Se(IV) within 5 hours. Additionally, on account of the magnetic properties of the nZVI its recovery could be achieved simply with the use of a magnet, leaving pure elemental selenium as the product. The potential for elemental selenium recovery and recycling provides grounding for the method becoming cost-neutral or even profitable. Furthermore, in depth studies were conducted to elucidate the pathway taken by the decontamination process, with attention focused on the nano- and microstructure of the resulting Se particles and of the nZVI before and after reaction. The nZVI particles consist of a metallic iron core surrounded by an oxide layer which under aqueous conditions is capable of performing adsorption of Se oxyanions, thus paving the way for their reduction by the metallic core. Two types of Se structures result following the reductive process: almost perfectly spherical nanoparticles and nano-needles, both being attributed to known forms of elemental Se: amorphous and trigonal, respectively. Jean-Pierre Sauvage, Fraser Stoddart and Ben Feringa have just been awarded the Nobel Prize in Chemistry for the design and synthesis of molecular machines. Ranging from artificial muscles to micromotors, these nanomachines can perform different tasks and present a myriad of applications. In 1983, Sauvage linked two-ring-shaped molecules by a freer mechanical bond. He was then followed by Stoddart who developed, among other things, a molecule-based computer chip, and more recently Ben Feringa who designed a nanocar. These three remarkable scientists were pioneers in the field and many others now benefit from their contributions to science. Taking advantage of these findings, Uygun and colleagues developed unique micromotors that offer high-speed metal remediation. Microscale machines have been used for accelerated isolation and degradation of toxins and clean-up of oil-contaminated water, among other uses. The continuous autonomous movement of functionalised nanomachines around a contaminated sample leads to enhanced transport of the remediation agent resulting in greatly accelerated decontamination. However, most of these require external fuel, such as hydrogen peroxide, and expensive catalysts, which then prevents their widespread use. Only recently have new fuel-free Mg-based microparticles been developed. They are highly biocompatible as they use water as their sole fuel. Using these new nanomachines, Uygun describes a Mg Janus-micromotor that is functionalised with meso-2,3-dimercaptosuccinic acid (DMSA), which has been recognised as an excellent chelating agent for heavy metals (Figure 1). Figure 1. Micromotor “on the fly” removing Zn, Cd and Pb. The micromotors were prepared by half-coating magnesium microparticles with Ti and Au layers and the external gold surface was modified by incubation in DMSA. The removal of its passivation layer will expose the Mg surface allowing an Mg-water redox reaction that generates hydrogen microbubbles leading to an efficient water-propulsion. Moreover, a small number of micromotors can lead to a nearly complete removal of heavy metals within a short period of time and they are not impacted by co-existing metal ions present in complex samples, making these nanomachines an interesting and cost effective option for fast removal of heavy metal pollutants. By developing these self-propelled water-driven molecular machines, Uygun and colleagues are corroborating the Nobel Prize laureates and spreading the belief of the Swedish Academy of Science: “we are at the dawn of a new industrial revolution of the 21st century and the future will show how molecular machinery can become an integral part of our lives”. 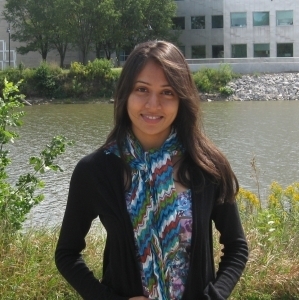 Luiza Cruz is a PhD student in the Barrett Group at Imperial College London. Her work is towards the development of new medicines, using medicinal and natural products chemistry. *Access is free until 20/11/2016 through a registered publishing personal account. How do iron oxide nanoparticles react? Iron oxide nanoparticles are not just a laboratory curiosity but a major presence within the whole of the natural world. Ferrihydrite is the predominant iron oxide nanoparticle found under abiotic conditions owing to its very low surface energy. The essential function of iron storage and transport within living organisms is carried out by the protein ferritin, made possible through the incorporation of iron nanoparticles inside the protein’s internal cavity. The ability of ferritin to template the formation of iron oxide nanoparticles of defined size has been exploited in the production of systems used in targeted drug delivery, magnetic resonance imaging and nano-electronics. The ability of the iron core in ferritin to adsorb phosphate anions has also been put to use in removing this nutrient down to levels which prevent the development of bacteria on water purification membranes. In spite of being recognised for their essential function and with much work dedicated to the development of exciting applications surrounding them, iron oxide nanoparticles have been so far poorly understood at a fundamental level regarding their structure and reactivity models. Their implicitly small size and low symmetry has made imaging difficult using conventional crystallographic techniques. The properties of nanoparticles are generally dependent on their size and any model attempting to quantify the reactivity displayed by the surface must take this into account. The nature of the surface itself is dependent on the chemical properties of the surrounding environment. Hiemstra and Zhao have conducted both an experimental and a computational study in order to generate a valid reactivity model for the adsorption of phosphate and arsenate by ferrihydrite and by the ferritin core. 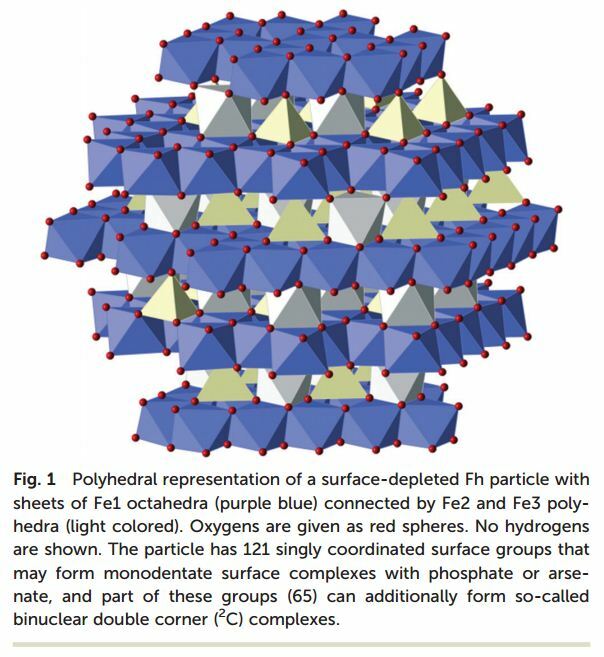 Ferrihydrite was modelled and essential properties such as surface area, density of surface reactive groups such as O(H), and surface charge were calculated as a function of the particle size. The experimental study followed the adsorption of phosphate anions onto freshly prepared ferrihydrite and the effect of phosphate concentration on the formation and properties of iron oxide nanoparticles inside ferritin was analysed. Corroboration of theoretical with experimental data allowed for the development of an anion adsorption model with account for surface reactivity and generated new understanding concerning the formation, growth and aggregation of iron oxide nanoparticles under conditions relevant to environmental applications. What makes car tires resistant to mechanical and chemical stress? The answer is nanomaterials. Particularly Carbon Black (CB) and silica nanomaterials which reinforce rubber increasing its durability, road grip and mileage. Other materials, such as carbon nanotubes (CNTs), offer better performance and ecological benefits via fuel savings. However, these are more expensive therefore their use is still very limited. Nanomaterial fragments are generally released into the environment, constituting a rather uncontrollable source of emission of nanocomposites. In some countries where release quantification is already required, these emissions have been estimated between 4,000 and 7,000 tons of microplastic fragments. 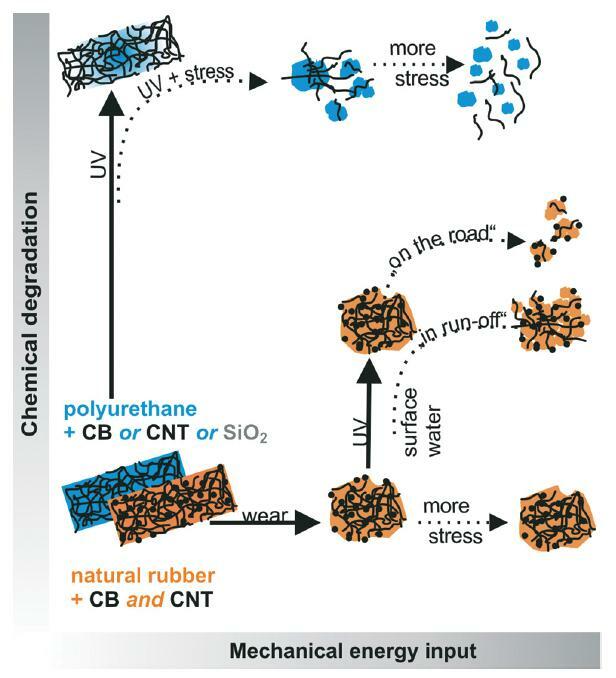 In spite of this immense environmental impact, little is known regarding the release from nanocomposites under mechanical and chemical stresses combined. Challenging the hypothesis of release being induced by a synergy of stresses, Wohlleben and co-workers bring a new sequence to test degradation pathways (Figure 1) as well as a fresh look at appropriate analytical techniques. Figure 1. Synergetic degradation pathways by combined mechanical and chemical stresses. In both cases shown in Figure 1, only chemical degradation or mechanical shear does not induce appreciable release of fragments. This happens only when the second stress is introduced, showing that synergetic degradation occurs on the diagonal of the scheme shown above. In the first case, polyurethane (PU) with different single fillers (blue pathway in Figure 1) was first aged under standard conditions then put under mechanical stress simulating rain conditions (immersion, shaking or sonicating). Ultraviolet spectroscopy (UV-Vis), transmission electron microscopy (TEM) and analytical ultracentrifugation (AUC) or field flow fractionation were used to analyse the results. Images from X-ray photoelectron spectroscopy (XPS) showed that nanofillers remain on the surface after UV and rain weathering, accumulated into dense agglomerates as the polymer matrix was removed by the combined photolysis and hydrolysis. Moreover, by creating an extended, highly reproducible, very low scatter semi-quantitative method to analyse turbidity of the released fragments, Wohlleben and co-workers were able to affirm that the release was reduced when CNTs were used (Figure 2a). Considering fragments below 150 nm diameter, PU filled with CNTs also showed reduced release (Figure 2b). More importantly, fragments coming from PU with CNTs were mostly organic, showing that the release of nanofiller fragments was suppressed. Figure 2. a) Turbidity assessment of the released fragments from aged PU surfaces after UV and rain, with increasing mechanical shear: 24 h immersion (light grey), 24 h shaking (dark grey) and 1 h sonicating (black). b) Size-selective analysis (AUC) of fragments in the size range of 5 nm to 150 nm released from aged PU surfaces after UV and rain, with increasing mechanical shear: 24 h immersion (light grey), 24 h shaking (dark grey) and 1 h sonicating (black). In the second case in Figure 1, natural rubber (NR) nanocomposite were filled with 40% CB and 4% CNT representing an innovative reinforced tire tread and it was compared to NR with 40% CB representing a conventionally reinforced tread and also to neat NB. The test focused on a sequence of mechanical-chemical-mechanical stresses, enabling the simulation of dust aging on dry roads and also the direct run-off into surface waters of the secondary fragments using UV irradiation. During sanding, there was no noticeable difference between the particle concentration of the three rubber specimen. After aging, the structural differences of the fragments were minimal between wet and dry aging. Moreover, being CB and CNT both relatively more inert to UV degradation, they seem to have accumulated on the surface (less oxidised organic structures were quantified). Fragments could potentially release smaller fragments and even free nanomaterial. Hence, Wohlleben and colleagues also analysed this scenario and indeed, smaller fragments were formed when a second sanding process was introduced, with no significant differences between NB with both fillers and only CB. However, it clearly showed that dry aging induces stronger secondary fragmentation than submersed aging, these results being in contradiction with the expected combined effect of hydrolysis and photolysis being more aggressive than photolysis only. In summary, regarding analytical techniques, simple UV-Vis was shown to be the most sensitive technique. Qualitative identification by TEM is essential and analysis of XPS images was also important for a plausibility check. This study is the first to analyse the combined forces of mechanical fragmentation, environmental aging and again mechanical stresses, showing a stepwise sequence that could continue ad infinitum and be tailored to simulate specific scenarios and provide useful estimates of release rates, enabling more reliable modelling and risk assessments. *Access is free until 07/11/2016 through a registered publishing personal account. Significant quantities of radioactive compounds are contaminating our environment. Due to nuclear weapon production during the Cold War, large quantities of radioactive Technetium-99 (99Tc) has been released into the environment. Although the Cold War ended 25 years ago, the total Tc inventory continues to rise as it is a major product during the generation of nuclear power resulting from the nuclear fission of uranium and plutonium. Radioactive Tc is long lived and predominantly found in nuclear waste, in the highly mobile form of the water-soluble pertechnetate anion TcO4–. The high mobility possessed by TcO4– causes concerns regarding its distribution within the environment and makes storage impracticable within cement-based materials, a widely employed medium for the storage of nuclear waste. Reduction of TcO4– from Tc(VII) to Tc(IV) is one possible solution. This is a challenging solution as Tc(IV) tends to convert back to TcO4– if exposed to oxygen. The reduction process requires a proton source to proceed and is disfavoured under the strongly alkaline conditions found in the waste media. The nuclear waste tanks also contain a large amount of both spectator ions, which make TcO4– more difficult to reduce, and high-valent metal species such as Cr(VI). This can interfere with the reduction process by consuming the available Sn(II) and/or by converting any formed Tc(IV) back to TcO4–. To overcome these obstacles, Eric D. Walter and colleagues have devised a novel Tin(Sn)-based material which displays selective and efficient removal of Tc under conditions similar to those found in nuclear waste tanks. The approach taken relies on the inclusion of both Sn(II) and Sn(IV) within an inert aluminophosphate matrix. The low-valent form of tin is known for its ability of reducing Tc(VII) to Tc(IV), whereas the high-valent Sn(IV) was chosen for its ability to form SnO2 phases capable of accommodating the resulting Tc(IV) and thus facilitate its sequestration. Representative SEM images of the Sn–Al–PO4 composite (A) before and (B) after exposure to TcO4 − . An amorphous Sn-based matrix containing the majority of the aluminium. This material has a large surface area and contains predominantly Sn(II), a combination of properties expected to yield efficient reduction of pertechnetate from the solution medium. Small embedded fibres of crystalline material with the composition dominated by Sn and phosphate. Earth, wind and the sun = gold? The precious element gold can exist in various forms, the most thought of probably being the shiny solid treasured for its aesthetic qualities. However, a number of other relevant forms exist not just in the chemistry laboratory but also in nature. Gold in its common oxidation states (I and III) can be found in water sources in the environment at appreciable concentrations. The coexistence of natural organic matter (NOM) and gold dissolved in surface water opens up the possibility for photoproduction of gold nanoparticles (AuNP), a form of gold which displays toxicity towards aquatic organisms and is prone to becoming distributed through the food chain upon ingestion. In this Environmental Science: Nano paper entitled Aqueous photoproduction of Au nanoparticles by natural organic matter: effect of NaBH4 reduction the authors’ attention is focused on investigating what NOM functionality is involved in AuNP formation, and which mechanism is being facilitated by its presence. Samples of NOM from various sources were included in the study and characterised using their content of carbonyl, quinone and aliphatic functionality. Samples with a large percentage of the former two showed an enhanced ability for AuNP production under simulated sunlight conditions, whereas a large content of the latter afforded inferior performance in this respect. In order to test whether this oxygen-containing functionality was responsibile for the facile production of AuNPs a selective chemical reducing agent, sodium borohydride (NaBH4), was chosen to remove it from the NOM samples. This modification led to Au3+ reduction by NOM being observed, albeit at a much slower rate, which confirmed the importance of the carbonyl functionality and suggested that other functionality in the NOM was ultimately responsible for performing reduction. One way in which the carbonyl functionality could accelerate the photoreduction process is by acting as a convenient electron source following the absorption of light, with the molecular oxygen/superoxide radical pair acting as an electron shuffle between the NOM and the gold cations. Formation of the superoxide radical on irradiation of NOM solutions was followed using electron paramagnetic resonance both before and after NaBH4 treatment. Elimination of the carbonyl functionality hindered formation of the superoxide radical, however a correlation between superoxide concentration and AuNP formation rate could not be established. To test whether the superoxide radical was involved in the nanoparticle formation process, the enzyme superoxide dysmutase was added. The enzyme efficiently removed the superoxide radical, which led to an expected decrease in rate. These observations helped support the operation of the indirect reduction mechanism, however not to the dismissal of alternatives. Indeed another mechanism which is believed to operate in parallel is based on the charge transfer from the NOM directly to the gold cations in complexes formed between the two (the charge transfer mechanism). Experiments carried out with model substrates of aromatic ketones and quinones further supported the role that had been ascribed to the carbonyl functionality. Aromatic ketones proved superior over the quinoid model compounds in the generation of nanoparticles, as faster reduction was achieved even at much lower substrate concentration and indicated that NOM quinones played only a secondary role in the production of AuNPs. Noteworthy was the decrease in photoreduction rate observed upon NaBH4 treatment of quinones, which indicated that the resulting phenolic functionality was not responsible for photoreduction as had been previously believed. Jiahai Ma and co-authors from the School of Chemistry and Chemical Engineering have shaped our understanding for the central role that the aromatic ketone functionality in natural organic matter plays in the photoproduction of gold nanoparticles in the aquatic environment. And remember, you can submit directly to Environmental Science: Nano! Alumina (Al2O3) nanofibers have potential applications as catalyst support structures, reaction substrates, filtrations devices and sensors as a result of their high thermal stability. On the other hand, the fibrous nature of these materials calls for extra caution because of their potency to cause pulmonary diseases. Fiber respirability and durability are among the dominant factors contributing towards the potential toxicity. The aerodynamic diameter controls the respirability while dissolution is related to the durability. A fiber is considered bio-durable if the rate at which it dissolves via chemical dissolution is slower than the rate of physical removal by the lung by mechanical action. Therefore, Hyeon Ung Shin, Aleksandr B. Stefaniak, Nenad Stojilovic and George G. Chase from University of Akron, National Institute for Occupational Safety and Health and University of Wisconsin Oshkosh has investigated the dissolution of electrospun Al2O3 nanofibers in human artificial lung fluid and free radical generation to determine the influence of physicochemical properties. Where (1-M/Mo) is the mass fraction of material dissolved, t is the time (days), SSA is the specific surface area (cm2g-1) and k is the chemical dissolution rate constant. The free radical generation was probed using electron spin resonance spectroscopy (ESR). The study has shown no effect of physicochemical properties on the Al2O3 dissolution in artificial human lung fluid indicating the differences in the heat treatments does not affect the solubility within lungs. However, greater dissolution rates were observed for the samples with higher heating ramp rates even though their physicochemical properties were similar. No measurable levels of free radicals were generated by these alumina nanofibers. Nanotechnology – old or new? Summer is almost over and so is a whirlwind of environmental engineering- and nanotechnology-related conferences. At a previous environmental nanotechnology-related conference, I had the great experience to participate in a lively debate on a very fundamental, albeit not often asked question in our field: is nanotechnology novel? At first, one may think this question should not even be open for debate, since the very idea of nanotechnology evokes exciting futuristic thoughts about the future of medicine, solar energy, nanorobots, and even science fiction. In my view, nature’s nanostructures can be informative of how the environment responds to nanomaterials and their study is instrumental for informing environmental nanoscience and technology. However, the potential existence of natural analogues to engineered nanostructures is no evidence that there is reduced likelihood of adverse environmental effects, since after all, with the exception of a few synthetic compounds (e.g., CFC), most environmental pollutants exist in nature. We just happen to place them where they don’t belong (e.g., lead in the atmosphere). This work takes you around the universe and back to demonstrate the importance of determining whether naturally-occurring nanomaterials are representative of the novel and well-controlled structures engineered by man. Nanotechnology: nature’s gift or scientists’ brainchild? 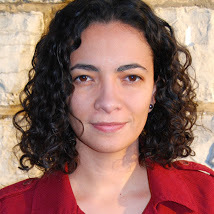 Marina Vance is a PhD research scientist at Virginia Tech and Associate Director of @VTSuN. She is interested in air quality, nanotechnology and health. You can find more information about her in mevance.com.